A large number of Under Armour Jet Mid owners love wearing the shoe because of its nice colors. A good number of buyers are happy with the price of the Under Armour Jet Mid. Several wearers appreciate that these UA basketball shoes do not need much time to break in. A lot of wearers agree that the shoe model is stylish because of its clean and simple look. 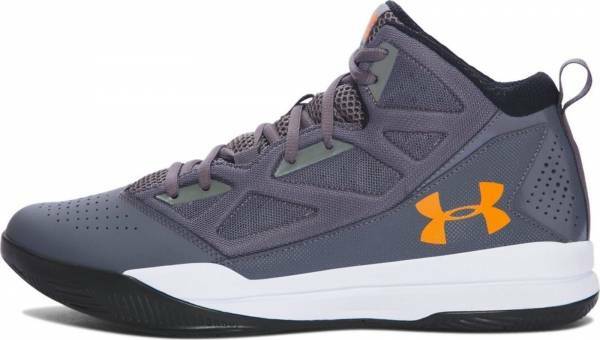 The EVA foam used on these Under Armour basketball shoes must have worked because plenty of users say the shoe is comfortable and lightweight. A number of buyers say that these Under Armour shoes run narrow. Some have reported that the material on the upper starts to rip after just a few uses. The forefoot area of the shoe model is quite tight compared to standard sizes, say some users. A small number of wearers complain that the inner parts of these Under Armour basketball shoes cause the skin on their Achilles heel to have blisters. The Under Armour Jet Mid is considered an everyday shoe for any activity, but the shoe model really belongs to the basketball category. It is a performer at a good price. It may not have the most up-to-date technology but the Jet Mid is a pair that can deliver as advertised. If wearers opt to use the latest technology Under Armour has to offer, Stephen Curry has recently released his sixth Curry signature shoe. For those who don’t like to pay premium for signature shoes, the UA HOVR Havoc is a great alternative. The Jet Mid is another affordable model from Under Armour’s Jet series. It has the same technology and design as the low-top version. The amazing herringbone traction delivers exceptional footwork control. The EVA foams in the midsole and insole work together to treat the player’s foot to an ample amount of cushion without sacrificing the shoe’s responsiveness. Cushion. The insole and midsole are both made of full-length EVA foam. Both are lightweight, and they deliver comfort to the foot. The tongue and inner parts of the Under Armour Jet Mid have thick padding that provides a good amount of support and cushioning to the ankle. Traction. The Jet Mid has good court grip because of the multidirectional herringbone pattern on its outsole. This traction pattern is used by most companies in their shoe lines; be they signature or not. The thickness of the one-piece rubber outsole provides stability to the footwork of the athlete. Length and Width. The Under Armour Jet Mid comes in the standard width and length. However, as most buyers mention, the shoe runs a little narrower than the average shoe model in the market. Therefore, new buyers are advised to either go up half a size or look for something else. Lockdown. The lockdown of the shoe model is provided by its lace-up closure mechanism. To get the best fit, the padded tongue and oval shoelaces can be adjusted to obtain a firmer support. Engineered mesh and synthetic leather are the materials used on the upper of the Under Armour Jet Mid. The forefoot area and heel counter are designed to have perforations to boost the shoe’s ventilation. To provide breathability in the midfoot area, it has molded quarter panels that are made of textile to wick away moisture. The Jet Mid is a simple and presentable mid-top. There are a number of colorways to choose from. It is designed as a basketball sneaker but this shoe model fits any activity. To easily put on and remove the shoe, the shoe has a sturdy pull tab with the UNDER ARMOUR callout. The company logo is located on the tongue, outsole, insole, and both sides of the shoe.